Of all RVs – motorhomes, travel trailers, popup campers, truck campers, fifth wheels – travel trailers are by far the most popular. More than half of all RVs sold are travel trailers. And this isn’t surprising. Travel trailers provide some great advantages for both new RVers and experienced fulltimers. 1. They’re affordable. The least expensive RVs are travel trailers. This isn’t to say that all travel trailers are inexpensive: you can pay $150,000 for a large luxury model. 2. You don’t (necessarily) need a specialized tow vehicle. If you buy a fifth wheel, you’ll need a heavy-duty pickup truck, with a tow package and a gooseneck hitch installed in its bed. On the other hand, a small travel trailer can be pulled by an ordinary car. You’ll need a trailer hitch, of course, but that’s about it. 3. You can use your entire tow vehicle for storage. A fifth wheel gooseneck will fill your truck bed. Conversely, a hitch for your travel trailer will not use up any usable space at all. You can still use your truck bed for storage, or the back of your SUV for passengers. 4. They’re the easiest and cheapest to maintain. Every RV will need occasional servicing. Motorhomes are the most expensive to maintain, since they not only have living space, but also an engine and associated systems. With fewer parts and systems to maintain, travel trailers are less expensive to keep serviced. 5. They’re less of a commitment. Casual RVers usually don’t need a full-size Class A motorhome. After all, when you’re not using it, you need to store the thing somewhere. And most of us don’t have a spare parking lot in our backyards. Travel trailers, on the other hand, are easier to store. Many RVers are content to have their trailers tucked away on their property somewhere, out of the way but easily pulled out for a spur-of-the-moment weekend trip. Plus, you don’t have to worry about the last time you changed the oil or topped off the antifreeze. So travel trailers are easier to use for casual trips. 6. They provide more usable space. A 30-foot travel trailer will have more living space inside than a 30-foot motorhome. How can this be? It’s because a motorhome has to use some of its interior space for the cockpit (the driver seat, passenger seat, and controls). Travel trailers don’t have to waste any inside space at all. 7. They’re more convenient once you’ve arrived. Unlike motorhomes, travel trailers require you to tow them to your destination, and this can be a hassle. However, once you’ve arrived and dropped your trailer, your tow vehicle is now available for you and your family to run around on side trips. Many RVers think travel trailers are the superior choice just for this reason alone. The hardest part of buying a travel trailer is choosing the right unit. Motorhomes generally have a limited set of floorplans (driver in front, master bedroom in the back). Fifth wheels have a little more variety, but the master bedroom is usually in the front. But travel trailers can have a bewildering variety of internal layouts. It’s not unusual for a single trailer model to have 10 or even 20 floorplans available. Want a huge galley (kitchen)? There are models available. Want sleeping quarters for 4, or 6, or 8? There are models available. Want the sleeping quarters in back, or in front, or even both? There are models available. You can approach this problem several ways. 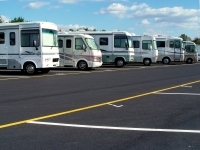 First, go to one or more RV shows, or to an RV dealer’s lot. (Be prepared to fend off the salesmen who will swoop down upon you.) Look at lots of different models, and see what you like the best. Then, pick up an RV buyer’s guide. These come out each spring, and can be found in the magazine racks at your favorite bookstore. Every major model of travel trailer is described. Each listing shows a sample floorplan, lists the various options, and gives a price range. They’re great for flipping through and comparing the various models side-by-side. Once you know what you want, it’s time to buy. Every single day, unprepared RVers overpay by thousands of dollars when buying travel trailers. Don’t make this mistake. Instead, do a little homework before you go to buy. Learn more about saving thousands when buying a travel trailer. You’ll save a bundle, and you’ll enjoy the trailer a lot more too!